The Mac’s Convenience store chain is not closing but they are taking on new names. Owned and operated by a company called Alimentation Couche-Tard since 1999, the stores are being rebranded to Circle K.
I spotted this change in my Saskatoon neighborhood retail center at Churchill on Taylor Street recently. 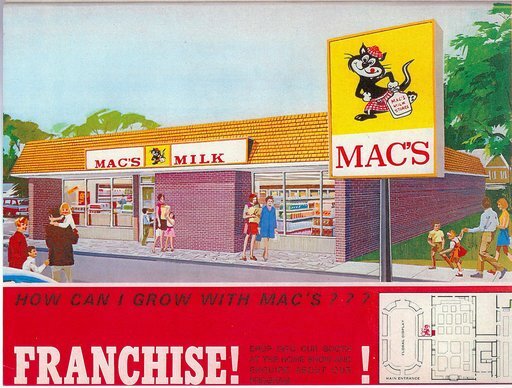 In 1971, the founders of Mac’s Milk Limited purchased 18 convenience stores and grew their portfolio by another 13 in 1974. Mac’s Convenience stores were officially branded in 1975. According to industry sources, there are a total of 5,906 stores nationally. If you’ve been paying close attention to these stores, you may remember that the original mascot was a cat named McTavish; it was changed to the current winking owl Hibou when the chain changed hands in ‘99. Depending on where you live in the city, the 7-Eleven in your neighborhood may have abruptly closed up shop. Two that caught my eye in Saskatoon include the Broadway Ave as well as 8th St/Grosvenor Ave location closures. Official word communicated from 7-Eleven has been elusive but they have indicated they are closing stores simply based on performance levels. That’s not to say they’re not making money, however, just that they’re not making what the company projects they should be. It’s likely not coincidental that most of the 7-Eleven closures also occurred on sites where there is no gas bar service. What moves onto these sites has yet to be determined but I wouldn’t rule out new convenience store operators. And the good news is, there seems to be plenty of convenience left in the convenience store business. 8th Street is a good example. Even with the closure at the Grosvenor intersection, there is still a 7-Eleven flanking both ends of the throughway at the corners of Clarence and McKercher. Regardless if you’re like me, it may not matter what happens to your closest convenience store provider. You may just continue to call your local convenience store whatever it was from when you were a child. If you’re from a small town in Saskatchewan, then it was most definitely a Red Rooster. The post Convenience store shuffles appeared first on The Saskatchewan Edge.